QPop, Little Tokyo’s cutting-edge art gallery and store, continues its tribute to one of the biggest science fiction properties in history. 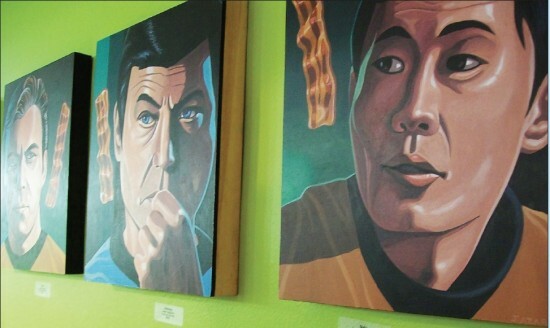 Conceived by owner Chris Mitchell and co-curated by Kali Fontecchio, the “Beam Me Up: Star Trek Art Show” runs through Sunday, March 3, with works from more than 80 artists sharing their unique takes on the iconic characters from every series and movie in the franchise. Participating artists include Patrick Awa, Joey Chou, Yok d’Holbachie, Kinoko Evans, Marty Ito, Carrie Liao, Tatsuro Maruyama, Ruriko Maruyama, Aki Morshima, Sho Murase, Ryan Nagata, Naoshi, Michelle Park, Chris Sasaki, Griselda Sastrawinata, Andy Suriano, Yukinao Takashima, Shojono Tomo, Wee Little Stitches and many more. Opening night, which drew hundreds, featured a costume contest judged actor Rene Auberjonois (Odo from “Star Trek: Deep Space Nine”).